Camp Host 101: Little Redfish Lake, home sweet home! It was practically love at first sight…but first, how we got there. As I mentioned in my last post, our visit to El Paso, TX was super-short due to weather and the lack of a car. It was the first time I have been in a Walmart and didn’t see any other white people! We were impressed by how art is everywhere in El Paso – even on the highways! Here are a few photos to give you a taste. Who let the dogs do what? Who let the dogs do WHAT?? Who? Who? Who? 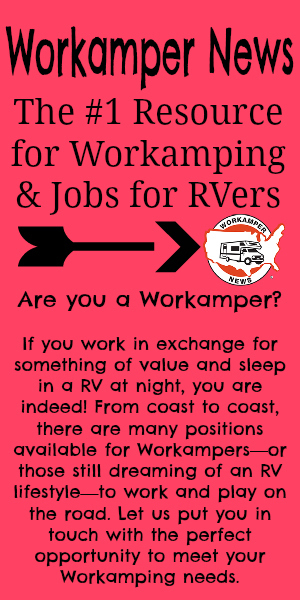 So when we meet people, which happens frequently, we get asked the same questions…I should get a t-shirt made the front says I’m a full time RVer and back is the questions. Where are you going next? What is your favorite place? What do you do for work? I love the stage and entertaining our guests! Enter your email address to support our Featured Bloggers, Guest Posts and More! Follow the blog to stay in the loop! ©1987-2017 Workamper News Inc. Workamper®, Workamper® News, and Workamper.com® are registered trademarks of Workamper News.